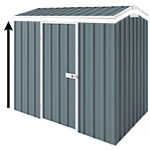 This extra high Absco workshop shed is 2.035m high at the walls and 2.3m at the gable making it easier moving in and out. It is the perfect height workshop shed for comfortable access and allows you to work in the shed comfortably as well. The Absco Highlander range is engineered to withstand winds of up to the wind rating N2 (147km/h). Ideal for non cyclonic areas, not available in cyclonic. For permanent secure installation of your shed it is recommended to use anchors. To secure your walls to the concrete slab, you will need 24 anchors for this 6m x 3m shed. We found the solution in the form of CheapSheds and an Absco 6m x 3m Highlander which was erected UNDER our rear deck. It’s nicely tucked away, but very conveniently placed close to the house and electricity supply. Due to increasing pressure from the family to have the large shed emptied, not ALL of the de-cluttering was done before things were transferred from the old shed to the Highlander, so it’s still a work in progress. 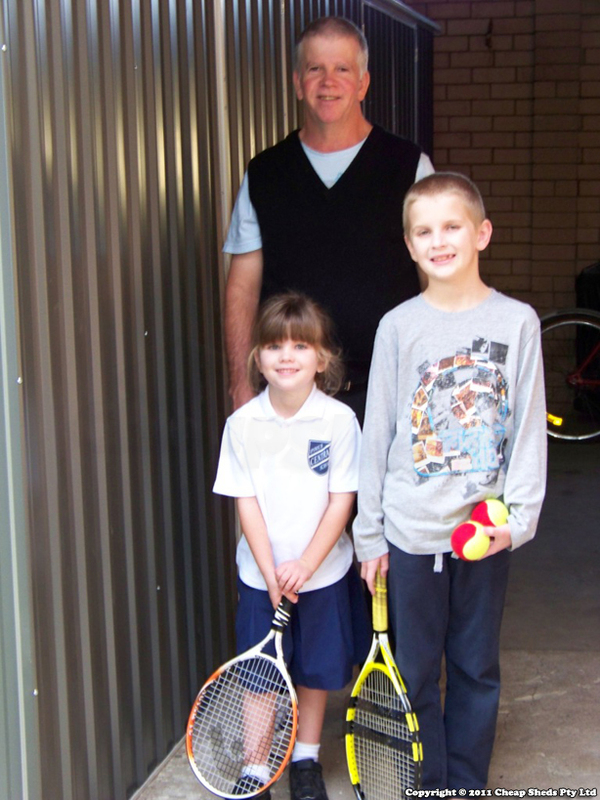 The best part about this whole experience though, is that the children now have a place to practise their tennis skills, ride their bikes and just be kids, while we have a lot less clutter and a very usable multi-purpose area. The key to achieving all of this was the Highlander – a much-appreciated addition to our back yard, and one that will be used for decades to come! Thanks CheapSheds and Absco for fantastic service and a great product!!! I looked around lots of sites for the cheapest but good quality garden shed. Decided upon the Highlander and it arrived quickly with everything included. Took 3 of us a day to build, and I imagine it would be quite difficult if only 1 person was doing it (the long sides especially) but very easy to snap together and just required some basic tools and a drill. The anchors and internal frame make this a very sturdy shed that will last. The skylight panel is a worthy option too, as it is quite dark inside and this lets in a good amount of light during the day. Shed Blanket (4) To help minimising roof condensation in your shed as well as to keep it cool in summer and warm in winter. A great investment if you spend a lot of time in your shed. Timber Flooring Kit (16) to substitute concrete slab. Made from 100% Australian renewable plantation grown timber. Comes with 10 Years Warranty.